I've got another crazy rant that I just can't keep to myself, but before I get into it, let me resolve my last epic rant. I did discover the identity of the individual eating cookies in the public bathrooms at the ATC. It was a fellow patient who was also suffering from steroids induced diabetes. She was sneaking sweets in the bathroom so that her mom would be none the wiser. Crafty, but gross. Sadly, my newest rant also involves the bathroom. Those individuals that come into close contact with me on a daily basis have been equipped with the rules regarding my health. The rules run the gamut from avoiding contact if you've been exposed to a sick person, to making sure you clean up after yourself. I understand that what generally happens in the bathroom can be a sensitive topic for people. I certainly wouldn't want anyone confronting me publicly about my habits, and yet I'm about to post a little anecdote about it for the world to see. Without going into too much detail, I discovered that someone that I come into regular contact with doesn't wash their hands after shall we say "eliminating". Sincerely worried about my health, I confronted the person and they confirmed my suspicions. The reason I was given was that urine was sterile. I was and am gobsmacked. I know that urine is "virtually" sterile which isn't the same thing as being absolutely sterile, so please hold all comments in that regard. Also, just consider human physiology and all that can be implied from the juxtaposition of certain elements. I restrained myself from screaming in horror and frustration and essentially gave another human being a lecture about potty do's and don't's. I sincerely thought that I wouldn't be having that conversation until Chris and I adopted a child. I also never thought that I'd be having that conversation with someone who was old enough to vote. So, with all of that being said, I'm seriously considering sewing myself a holster so that I can carry my giant can of lysol around with me on a daily basis. If my immune system was normal, I'd be laughing all of this off. Since it's not, I'm a little bit angry and frustrated. To put it in perspective, I've been handling a lot of the same things as this person for a few months now and am surprised that I haven't ended up in the hospital with an infection. I'll be wound up about this for a few days, but I'll do my best not to blog about it anymore. Here are some pictures of my friend Caroline's precious little guy modeling a hat and sweater that I knit for him a little while ago. You can just make out a sleeve on the sweater, but trust me it matches the hat. He's such a little cutie! All remains quiet here. I miss Chris very much and can't wait to see him next week. Maybe I'll have something more to report in a few days. I lifted this from Jim's blog, Run for Dori. Jim, I hope you don't mind. If you don't know who John Kanzius is, it's worth your while to do a google search. John Kanzius, a great man, has died at the age of 64, according to AP. Here is the brief:John Kanzius, who had no medical background but invented a device that kills cancer cells, has died at age 64.Kanzius died Wednesday at a hospital in Florida, where he had a winter home. Jack Martin, of Dusckas Martin Funeral Home in Erie, confirmed the death but had no further details.Kanzius used to be a partner at Erie's Jet Broadcasting Co. He invented a device that uses heat from radio waves to kill cancer cells without harming other cells.He created the device while suffering from insomnia brought on by chemotherapy [while being treated for leukemia].The University of Pittsburgh Medical Center and the M.D. Anderson Cancer Center in Houston are experimenting with it.Here's more and here's how you can help honor this man and hopefully be a big part of the cure for all cancers, including blood cancers.R.I.P., John Kanzius. When you're first diagnosed with cancer, you start making connections that you never dreamed of having. At first it may be unconscious on your part. Maybe it's a need to know that you aren't unique in your situation or a need for a sense of belonging. One of the first connections I made was with my current oncologist. I saw Dr. Bienvenue for what might be the last time today and I became a little sad. This was the man who put a name to my condition. He assured me that I wasn't crazy and he did his best to be sure that I held it together. He's gone the extra mile when Chris or I had concerns about crazy numbers and he's put up with a lot of strange questions. Always with a joke or a smile. I went to my appointment alone today since Chris is out of town with his new job. Of course I had Chris on speaker phone when Dr. Bienvenue came in. It felt like a Seinfeld episode and everyone was very good natured about it. My numbers were good and Dr. Bienvenue could tell that I was on a steroid taper since my white blood cell count was in the normal range (finally!). Of course my red blood cell count and hemoglobin are low, but that's to be expected at this stage. I was told that I look excellent and that my numbers were outstanding. Pretty high praise from someone who deals with multiple cancers on a daily basis. The last thing we discussed was our impending move to New Jersey. Dr. Bienvenue did his fellowship at Memorial Sloan-Kettering so we chatted about New York and New Jersey. He gave me some excellent advice on moving to this foreign area that is the northeast. He also very generously offered to set me up with someone from MSK since I don't have anyone lined up to see me locally once I get up there. If you're in BR or the surrounding area and need a good Hematologist/Oncologist, I'd very highly recommend him. I should be doing my taxes or culling my belongings in anticipation of the big move, but I can't seem to get motivated. There's a stack of papers 12 inches high waiting to get filed and several boxes of paper waiting to get sorted. I think I'll let them wait until tomorrow or the next day. A very dear friend just emailed me to let me know that she'd received the items that I'd knit for her little girl and baby on the way. 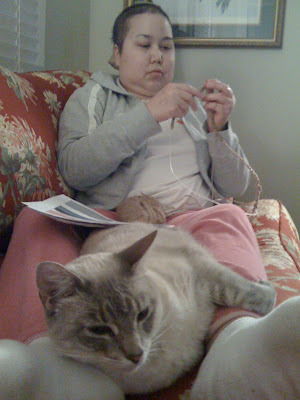 While I was knitting the items, I promised myself that I'd remember to take a picture of the sweater and beret. Did I? No, of course not. I wish that I could blame it on chemo brain, but I can't. I'm just not one of those people. It never occurs to me to take pictures of anything. 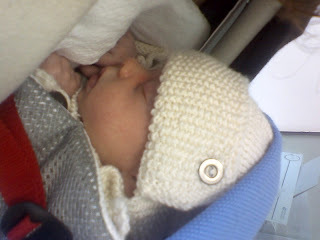 Thankfully, Heather sent a picture of her precious little girl wearing the hat. You can't see it very well, but I thought I might be forgiven once you see what an adorable model Heather's little one is. Now I just need to get permission from Caroline to post pictures of her adorable little guy modeling his gifts so you can see what I was doing during clinic. For the last two years I've spent a relatively small amount of time driving and when I do drive, it's Chris's truck. Since Chris is gone with the truck and I have a doctor's appointment on Thursday, I thought I should get reacquainted with my car. It's a 2000 Altima and I haven't set foot in it in two years. It was a revelation to say the least. I felt like I was driving around in a trench next to all of the SUV's on the road. It was just surreal after so long. The biggest revelation came when I tried to get out of the car. Because it's slung so low to the ground, I had to struggle to stand up out of it. It really made me realize that I'm nowhere near normal, no matter how much I feel that I am. At first, I thought I would have to pull myself out of it by hanging on the door. Thankfully, I was able to get to a standing position after a minute or so. It was quite frustrating. I imagine the feeling was very similar to what a child feels when they figure out that they can't do something. I'm proud to say that I didn't burst into tears or throw a tantrum like I might have as a kid. In other news, a new side effect has presented itself now that I've been taking Noxafil for almost two weeks. I am so unbelievably irritable. It's not rational in the least. I admit that there are a handful of things that push my buttons instantly on a regular basis and if you know me, you know what they are. Now everything sets me off, no matter how small. As ironic as it sounds, this irritates me to no end. I'm doing my best to rein it in, but I don't think I'm being very successful. All I can say is, poor Chris. The man really loves me to put up with all of this. My fingers are crossed that this all evens out like it did for the steroids. Speaking of, I started my second to last taper of Medrol. I have a little less than two weeks at 16mg, then I step down to 8mg for two weeks. This is an accelerated schedule thanks to my transplant doctor. If I had stayed on the original schedule, I wouldn't have finished until late April, early May. If the GvHD remains under control, then I can get off of the steroids. Bye-bye furry chipmunk face. I am definitely not going to miss all of that facial hair. Now I have to focus on losing the ten pounds that I've put on. One of my nurses insists that it's mostly water weight. I'll concede that some of it may be, but for the most part, it's fat. Wii fit to the rescue! I still have labs on Thursday, so I'll post more then. Chris accepted the job in New Jersey, so he left this morning for a week of training at the home office. Then he'll have to find a place for us to live so I can finally make a commitment to one of the many moving companies that call me all day long. Seriously, you call for one quote and you're on these people's hit list forever. The logistics of this whole affair seem a little overwhelming at the moment, but I know people do this everyday, so we'll pull it off, too. Dixie is in charge of looking after my day to day, but truth be known, there isn't a lot to look after. I just have to remember to take my temperature and report back to Chris. Taking my medicine is an automatic thing and Wii fit stares me in the face everytime I walk through the living room. In a nutshell, that's my entire day. Since I started using Wii fit more regularly, i.e. at least 3 times a week, I've noticed that I haven't been having problems with my knees. I have developed a new problem with my ankles, but I think it's non-related. I've started getting cramps in my feet and ankles at night. If I don't get up and walk to stretch the muscles, the cramps start to radiate up my legs all the way to my hips. My ankles will lock with my toes pointing inward and it's very difficult for me to get them to move. It's almost as if there's a disconnect between my brain and the muscles that are spasming. It's painful in the sense that it's a charlie horse, but nothing like the pain I was enduring with the nightly knee episodes. I've reported it to my transplant team and they don't seem worried. It's probably just another manifestation of GvHD. I have an appointment with my local oncologist on Thursday and then appointments in Houston two weeks later. We're hoping to coordinate the move to New Jersey that week. I'll report back on Thursday unless something happens between now and then. The conditioning for the transplant and the steroids have been taking their toll on Ann's back, leg and hip muscles. Even though she has been tapering off of the steroids for a couple of weeks now, she has been complaining that it's difficult to do things like carry a modest weight while walking up a step. 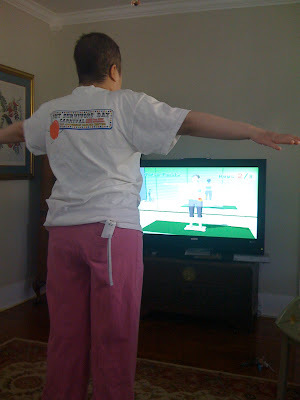 So to combat this she has started doing Wii fit at least once a day. This isn't a commercial for Nintendo, they certainly don't need my help in that department, but the results have been pretty impressive so far. So much so that I would strongly recommend that anyone who is recovering from a transplant go out and get a Wii and a copy of Wii Fit. The exercises are gentle to start off with and the difficultly is progressive enough for a variable amount of challenge. As you do more it rewards you with the option to take on more difficult and rewarding exercises. Its kind of like having your own personal physical therapist. After doing it for a couple of days Ann was very happy to point out to me that the steps on the front of the house were nowhere near the challenge they had been. Now she is able to help me do things like take the groceries from the car and carry laundry baskets. That might not sound like much, but considering doing those things left her totally wiped out before it’s a small step back to normal. More importantly, now when a 14 Lbs. cat sits on her she's not trapped for the rest of the afternoon. I had my monthly checkup in Houston yesterday and all is well. My blood work was normal for the most part, with the exception of my liver enzymes. Yet again they are elevated. Dr. Kebriaei thinks that this is due to the V-fend that I take and has decided to stop it in favor of Noxafil. She's worried that my liver is irritated due to a number of things, including extra iron from all of the transfusions I've received over the last two years. In two weeks I'll see my local oncologist for follow up blood work. If my liver enzymes are still elevated then Dr. Kebriaei wants to start me on a new medication that will help eliminate the iron from my liver. She's a little hesitant since I'll be the first transplant patient that she's prescribed this to. I've also been given the green light to stop testing my blood sugar. After quizzing me about my numbers and the amount of insulin I inject, she decided that maintaining the integrity of my skin was more important. W00t! I still have to follow a diabetic diet, but that shouldn't be a problem. She also wants to be more aggressive about tapering the amount of steroids I take. If all goes well, then I should be completely off of Medrol by the beginning of March. This does mean that I'll start to feel a lot more tired and will probably have more muscle wasting issues. I'll deal with it when it comes. If anyone needs me, I'll be sitting on the couch recovering from yesterday. One of the side effects of being on a high dose of steroids is that you may become diabetic. As a result of being on steroids since last November, I have become diabetic. I'm supposed to test my blood sugar three times a day and dose myself with insulin when appropriate. I've been very lucky in that I rarely need insulin, maybe two or three times a week. The shots are no big deal and having to stick myself to test my glucose levels rarely hurts. I do find the whole affair highly annoying, though. I've never been the kind of person who eats on a schedule. I much prefer to graze throughout the day when I'm hungry. Now, if I want a snack, I have to weigh my choice of food against what it will do to my blood sugar. If I eat too close to a set meal, I can guarantee myself a shot in the stomach. In the scheme of things it's a minor inconvenience and I know it's not going to be a permanent way of life, but there's a reason for this rant. Saturday morning I had a feeling that I was headed for a urinary tract infection. I wasn't displaying any symptoms, but a little voice in my head was telling me that I needed to do something before I started to run a fever or feel that ever pleasant tingle. UTI's are normally no big deal if you're healthy, but for me, it means a trip to the ER. Chris ran to the store and picked up six litres of cranberry juice. I drank three litres alone on Saturday. Here comes the rant...cranberry juice is full of sugar. (Yes, I know you can get the "lite" version which has significantly less sugar, but doesn't quite taste right.) My blood sugar has been out of whack all weekend. It's driving me crazy. It's also making me cranky, but I can blame that on the steroids. I've almost finished the last of the juice and hope that I've nipped this little problem in the bud. We're headed to Houston on Wednesday, so I should update by Thursday. Think happy thoughts.